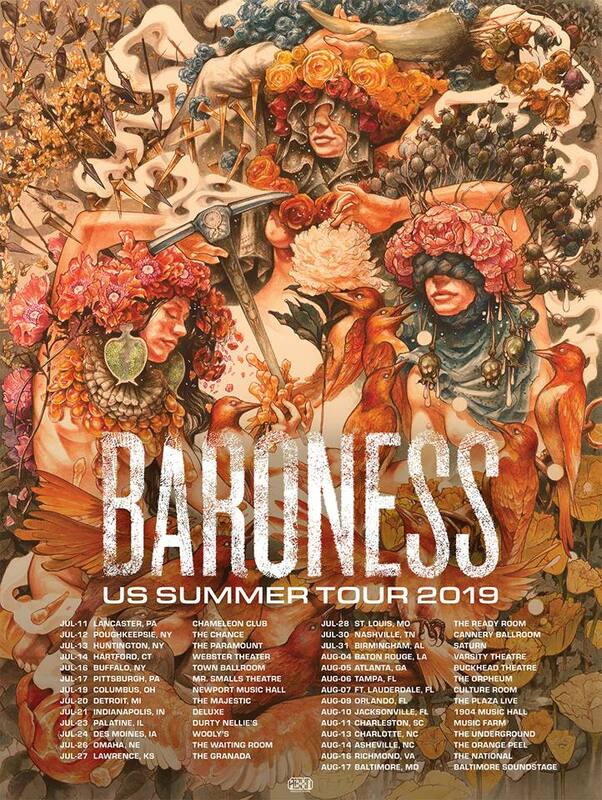 Progressive sludge metal legends Baroness don’t ever seem to slow down. While still on tour with Deafheaven and Zeal & Ardor, they announced a lengthy trek across the US on top of their tour of Mexico and South America today. ‘The Gold & Grey Tour’ now boasts a slew of new dates and destinations in addition to their already packed tour plan; together with the aforementioned shows booked in Mexico, Chile, Argentina, and Brazil, this newly announced US run will keep the band busy from June well into August. Besides stocking up on destinations, Baroness also released a new song off of their upcoming release Gold & Grey called “Seasons”. This track opens with a shoegaze-inspired intro driven by urgent-sounding drums, which stand in stark contrast to the dramatic vocals and chorus-enveloped guitars and bass. From under all the reverb and romantic noise of the instrumentation emerges a guitar lead that segues into the harder part of the song. Now, the drums changed their round, forceful push into a cymbal-driven gallop of shimmering treble. Glistening picked chords and monstrous octave interludes set the tone for most of the rest of the song, before collapsing into a wall of noise. You can get tickets for the upcoming shows here. Follow Baroness either on Facebook or on Bandcamp. Next PostBig Business - "The Beast You Are"